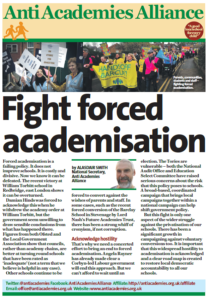 Roke parents vowed to give the Harris Federation a chance after the hostile takeover of their school by an academy chain, but after only one half term, patience is already wearing thin. The Harris Federation was brought in by the DfE as a saviour of standards after Roke received poor Ofsted ratings and controversially went into special measures. Since the Harris school opened on the old Roke site, there has been a catalogue of misdemeanours, with the new head teacher already having to apologise to parents for overzealous uniform inspections (http://www.croydonadvertiser.co.uk/Parents-fury-Roke-begins-new-era/story-19790889-detail/story.html#axzz2elfzfC6v) and giving out a ‘grammer’ and punctuation test (sic) full of English errors. Not only this but the head teacher’s apology letter also departed from the correct grammar for formal correspondence (http://www.theguardian.com/education/2013/oct/21/ministers-ignore-forced-academy-advice?CMP=twt_gu). This came the same week that Harris Norwood Academy hit the headlines for clamping down on improper English usage on the school premises. (http://www.mirror.co.uk/news/weird-news/slang-words-banned-london-school-2375346). Within a week of the ‘grammer’ test apology, another year group was given literacy homework in American English with alien sentences such as, ‘The children jumped rope at recess’. Such a nosedive in standards has been startling coming from an organisation that purports to turn schools around and brings to mind the words hypocrisy and double standards. Parents of children with special educational needs have been angered by the removal of crucial support for their children. Children with SEN but without a statement were previously getting one to one teaching, or emotional and behavioural support, but now receive none at all, or support only in a group setting. Families were not even informed about the changes until 6 weeks into the term. During the consultation period Harris responded to a request for reassurance about SEN provision with this response, ‘We would not want to change existing provision unless the data on progress and monitoring shower that support was not working as effectively as it should. Then we would discuss this with individual parents and agree changes to improve outcomes’. Discussion has not happened and the already the changes have been detrimental to the social and emotional wellbeing of the children concerned, as the rug of support has suddenly been pulled from under them. Parents and children have been left in tears, and many fear that they may have to consider other schools or home schooling for their children. There is also speculation that this is exactly what Harris wish to happen as it would eventually improve their results and league table position, and save resources. Effectively it means the school no longer caters adequately for all needs. There are also serious concerns about data massaging. On Thursday, many parents were surprised to receive the half-termly Harris progress report which, for many children, appeared to contradict the opinions of teachers expressed just 2 weeks ago at parents’ evening. Parents who were told face to face that their children were clearly exceeding the expected levels for their age, have suddenly been rated ‘below expected’ in the latest school data and their kids were deemed not to have made any progress at all since the last report. Harris provided each child with targets for the next half term, yet many parents said these had already been achieved in the last academic year when the school was still Roke Primary, and that their kids were well beyond that stage now. One parent said, “Only 2 weeks ago I was told my son was at the top of his class and performing at a level a year ahead of his age across the board, yet we are now being told he is below the expected level for reading and maths and a year behind for writing. Strangely, he is predicted to be more than a year ahead by the end of summer term”. The same pattern has been reported by other families right across the school. The head teacher sent a letter telling parents that “previous levels you have been given may vary slightly to the levels recorded on this report”. The leadership is claiming that detailed records on progress were not previously kept, which is untrue, parents have paper based reports from the Roke era using the same national curriculum levels. The new system is computerised. What parents are now being told by Harris does not stack up, the previous levels and the recent parent’s evening teacher verdicts tallied more closely with our own sense of what our children can or cannot do. The targets set by Harris are preposterously easy and have already been achieved. 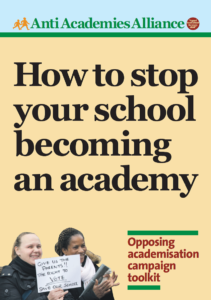 We predict that results will now show remarkable improvement during the first year of the Harris academy and be used as a false benchmark of their success in turning our school around, as well as legitimising contentious forced academy policy. Copies of original letters, reports, grammar test and homework are available on request. 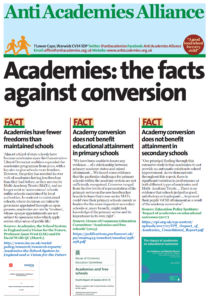 This entry was posted in News, Top story and tagged Forced academisation, Parents, Primary. Bookmark the permalink. Can I respectfully suggest that you proof read and correct your press release – given this is about criticisms of falling standards in Written English on the part of the Head you really should make sure your own criticism is correctly worded and grammatically correct. Also that dates and days match. Isn’t removing SEN support just another variation of excluding to improve? Remove SEN support and the student is either removed by the parents because their child is unsupported or excluded by the academy because the student can’t cope. Either way, if there are less students that required support, the academy’s results are likely to improve even if there is little or no progress elsewhere.